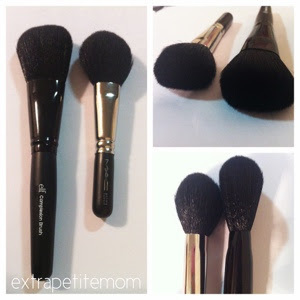 Having said that, I actually bought E.L.F Complexion brush. I bought their blush brush at first, then I find it a little bit too small for my cheeks then I went back to Paloma after two days to change the brush. :P Now that I have the Complexion brush with me, I feel like I want the blush brush back. Ok, you can call me crazy. *scream* Helppp!!! I do not even know why I need MORE THAN ONE blusher brush, powder brush, foundation brush and etc. *LOL* Again, you can call me ehmm crazy. I have bought EcoTools Bamboo Blush Brush. Well, my best friend bought it for me when she went to the UK for a winter holiday. You can see the post here [UK Haul]. Maybe you can have a look at Jessup brushes. Not sure if you're familiar with that brand but a lot of youtubers have been raving about it. I've actually bought two different sets and the quality is amazing for the price. Most people said it's a dupe for sigma and other higher-end brand. Can't verify that for you as i didn't own any high-end brushes. But compare this with brushes from etude, skin food, this one surpasses that by many levels. You can only get it from ebay and it's free shipping. I bought a dupe for Mr. Bunny and it only costs me USD16.54 which probably around BND22.19. I seriously recommend you this brand. The shipping to Brunei was not that long. It arrived 2 weeks earlier than the stated ETA. However, mine was provided with tracking no. So perhaps that's why it arrived much earlier than expected..... Still waiting for my first purchase that I made 2 days earlier than the one I received. Expecting to get it sooner cause this particular purchase had no tracking no. Sorry for the long comment. I like to give people sufficient info.